We have eggplants coming out our ears and I’ve been trying to find creative ways to eat them! I’m usually not a huge fan, although I’ve found that salting them helps to remove some of the bitterness and adds flavor! The texture was something my kids had to get used to, but this recipe was a huge hit for them! We also really like our eggplant pizza crust, but I’m always looking for more ideas! Of course I need it short and simple, but not lacking in flavor! This recipe certainly hit that. I made the recipe with the ingredients listed below and I thought it was going to be plenty! It was about 10 slices per person, but we ended up quite short and needed to pull out some leftovers from the fridge to supplement dinner! It was a good problem to have. I can say that doesn’t happen very often… that I don’t make enough food to eat! I think in part since this is a vegetarian meal, it doesn’t lend to filling bellies very quickly! We did have some stew left from a few nights ago which filled us up significantly and all was good! All that to say… if you have a tree climbing hubby who can eat a bear for dinner and two growing boys (only 6 and 4, but eat more than their mama) who consistently have hollow legs to fill, a little girl who is a crazy ball of fire who is in constant motion and mama who is nursing a growing baby… then 2 eggplants isn’t enough and the recipe would probably need to be doubled! This was a huge hit and none of us are usually big fans of eggplant… it looks like that is about to change. It is also a great seasonal dish since all these ingredients are due for harvest about now! Chop tomatoes and add basil and sprinkle with olive oil – the longer it sits at room temp the more the flavors meld. Pat dry with a different tea towel. Grill until tender and cooked. 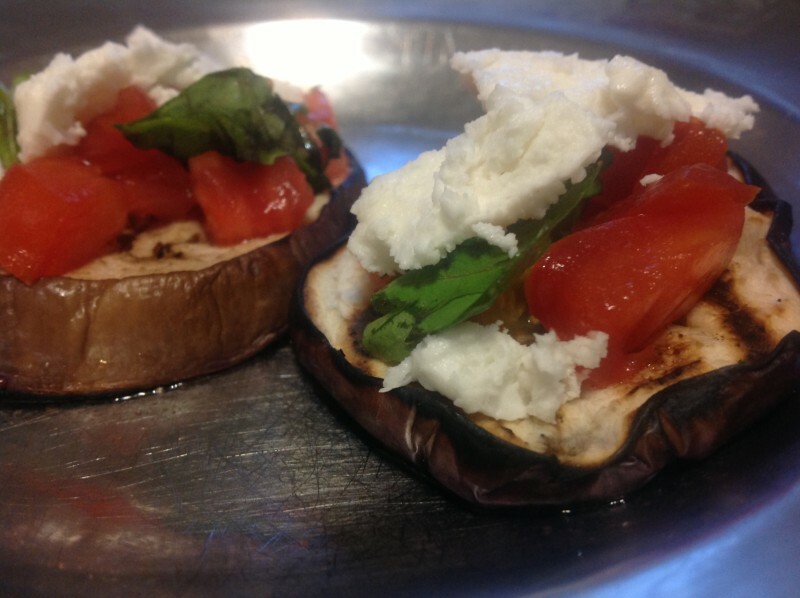 Serve warm eggplant and top with tomato and basil and small slice of raw goat cheese. So give it a try and PLEASE let me know what you think! We think it is AMAZING! And SUPER FANTASTIC! This looks really yummy! I love eggplant and have been missing it. I would often get it if we went out to eat at an Italian restaurant. But since many places use breading and I can no longer eat gluten I have been bummed! Thanks! I’m going to try it.